Swirling gas around black holes may be the key to estimating the masses of black holes otherwise too distant to weigh, according to a new study. Supermassive black holes millions to billions of times the mass of the sun are thought to lurk at the heart of all large galaxies. 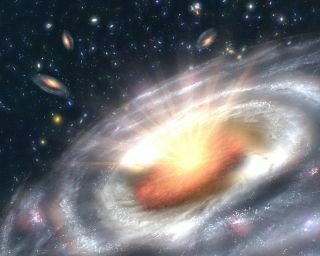 Oddly, the properties of these black holes appear linked with a variety of properties of their parent galaxies, such as how bright the galaxies are and the speed of stars within them. This suggests a fundamental link between galaxy and black hole evolution. "This is quite surprising, and not well understood, as these relations tie together black holes with event horizons on solar system scales and galaxies, which are billions of times larger," study lead author Timothy Davis, an astrophysicist at the European Southern Observatory in Garching, Germany, told SPACE.com. "Why a massive galaxy should care about its black hole, and vice versa, is not well understood." The CARMA telescope located in the Inyo Mountains in Eastern California. The combination of large and small dishes helped the authors zoom in on the gas in the center of NGC 4526. A Hubble Space telescope image of NGC 4526, overlaid with our molecular gas observations from CARMA. The black hole sits in the very center of the galaxy. Scientists have a number of strategies for deducing the masses of black holes, most of which involve watching the motions of stars or of disks of glowing hot, electrically charged gas as it swirls near the black hole. The mass of a black hole determines the strength of its gravitational field, and thus how strongly it pulls on surrounding matter. However, these approaches rely on telescopes that can see light from these stars and gas, which is only visible when relatively nearby. The new technique depends on the dynamics of clouds of cold gas around black holes. By comparing models of gas motions both in the presence and absence of black holes, researchers can deduce how massive a black hole must be to result in the gas motions they see. Molecular gas observations can overcome the resolution limit on strategies dependent on watching stars or ionized gas, helping researchers measure the masses of black holes much farther away. The scientists tested their model on gas seen around the supermassive black hole in the galaxy NGC 4526, which is 53 million light-years away in the constellation of Virgo. They employed the Combined Array for Research in Millimetre-wave Astronomy (CARMA) telescope in California. "We observed NGC 4526 with CARMA's sharpest array, achieving a resolution of 0.25 arcseconds," Davis said. "This is the equivalent of being able to spot a one euro coin (or U.S. quarter) being held up 10 kilometers (6 miles) away! With these super-sharp images we were able to zoom right into the center of NGC 4526, and observe the gas whizzing around the black hole." They estimate NGC 4526's central black hole weighs about 450 million times the mass of the sun. "We have shown for the first time that it is possible to use molecular gas observations to measure black hole masses," Davis said. The ALMA telescope, currently under construction in the Atacama Desert of Chile. Using the power of this new telescope, this study predicts it should be possible to measure black-hole masses in hundreds of galaxies. Using next-generation scientific instruments such as ALMA, the Atacama Large Millimeter/submillimeter Array, this method could determine black hole masses in hundreds of galaxies in less than five hours of observations each, researchers say. "The measurement we have made on one object took over 100 hours of observing time with the CARMA telescope in California," Davis said. "With the new ALMA telescope currently being built in Chile, the same measurement can be repeated in just 10 minutes!" "The next step will be to observe a sample of spiral galaxies with the ALMA telescope, and determine their black hole masses," Davis said. "Even starting with 10 objects will about double the number currently available to study, and allow us to start determining if they follow the same black-hole mass relations as early-type galaxies." The scientists detailed their findings online today (Jan. 30) in the journal Nature.